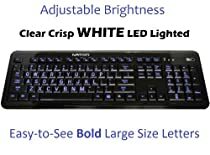 This LED Backlit keyboard is the most innovative idea for anyone with extensive computer use. No more eye stress, the clear and sharp contrasted non-glare LED lighted keys and large bold lettering relieves the common strain on your eyes. This is the best solution for using your computer in dim or dark places. No more keeping the lights on when others want to sleep, quiet tap cushioned keys lets you type away while others sleep peacefully. With numerous additional convenient and comfort features, this is a must have for everyone with a computer. Extra Large Bold Illuminated Letters eases the strain on your eyes. Can be used in places where there is no lighting or dim lighting. Great when using in bed at night and your roommate would like to sleep, or you would like to fall asleep without getting out of bed to shut the room light. Adjustable Brightness can be adjusted to three different levels to suite your comfort and surrounding light. Full Size with 104 keys are all the right size and not squeezed together, but rather separated and placed all in the right spot. 12 Hot Keys Features all standard hot keys to save you time and makes navigating easier for you. Easy Tap Keys Strong construction keyboard has the extra comfort of whole silica gel smooth touch quiet tap cushioned keys. Easy to See, Extra Large Bold Lettering makes this keyboard easy on your eyes; causing less vision strain and promotes faster productivity. An excellent choice for the elderly or vision impaired as well as children learning how to use a computer. Gentle, Crisp & Clear White LED illuminated backlit letters eases the strain on your eyes. Extremely useful in places where there is no lighting or dim lighting. Great when using in bed at night and your roommate would like to sleep or you would like to fall asleep without getting out of bed to shut the room light. Lighted keys also make it more fun for children. Brightness can be adjusted to three different levels to suite your comfort and surrounding light. Full size slim design with all 104 keys the right size and placed in the appropriate spot on the keyboard and not squeezed together like the compact models. Strong construction keyboard has the extra comfort of whole silica gel smooth touch quiet tap cushioned keys. Features all standard hot keys to save you time and make navigating easier for you. Includes: Media Select; Volume Down; Volume Up; Mute; Previous; Next; Play/Pause; Media Stop; Web Home; Email; My Computer; Web Favorites. 74 of 76 people found the following review helpful. GREAT KEYBOARD WITH ALL THE BELLS AND WHISTLES!!! I am a review reader big time before I make any purchase if available.I'm paralyzed and my hands are restricted a little,plus the older I get my eye's aren't that great.Also,for the last 3 months I have been bedridden and just bought a new HP all-in-one desktop computer that came with a wireless keyboard & mouse.They were just horrible.So,I was looking for a backlit keyboard that hopefully had larger letters to see.So,I first seen the Longitech backlit with larger letters and weren't all jammed together.It had all great reviews but,it was also out of my budget at this time.I found this one and read a lot of reviews,alot of great and not so great reviews,and some reviewers I have found to nit pick every little thing they could find wrong with this keyboard.So,for the price was in my budget and had all I was looking for.Had it deliverd in 2 days with Prime,and out of the box I plugged in the mini receiver to a 2.0 usb port and cut it on and I instantly loved the whole setup of the keyboard.The letters are big and very bright blue for using in the dark as do a lot,plus you have a button at the top to make it dimmer or off.The keys aren't all smashed together and has what I call a short press of the keys,kind of like a laptop keyboard.I have had it now for 5 days and have not had to plug the USB cable included to charge,nor has the little warning light came on right out of the box.ike I say,it turns itself off about 30 secs.of not touching anything on the keyboard or you can turn it off yourself if you want,I haven't had to.All in all,this is a great keyboard if your looking for the specs.like I needed and more.Great Purchase!!! 68 of 71 people found the following review helpful. I am very disappointed. This product has ALL the features I wanted - wireless, large print, backlight, but it just works like crap. Incredible key pressure is required, and even with pushing VERY hard many missed letters. My finger tips actually get numb using this thing. Have to go back and edit due to skipped leters again and again and again. I have been locked out of websites again and again due to incorrect password entry - when I can't confirm what I am typing in. If this is an adjustable feature - I'd like to know. Even so keys seem to scrap against each other, making it hard to get firmm contact with the key membreane switch. It seems trivial, but this flawed keyboard key issue makes this such a pain to use that I would not recommend it. I can't stand it anymore. 260 of 277 people found the following review helpful. Has some ergonomic issues, and static dust attraction. The problem is this seller started with one keyboard, and has substituted another keyboard that is totally different. This I found out when I asked a question about the comments that the keys were smaller (BS, SFT) then normal, but the current photos of the keyboard show a normal looking layout. 11-28-2013. If your going to have a review system, the seller can't use the positive reviews of another item to then sell a different product. Now I can't trust any of the AMAZON reviews if this is allowed to continue. For reference, I've seen other sellers doing this same practice, this really is wrong if you base your sorting on average product review sorting option. And this is not the only product where this DECEPTION of different products mixed by the seller is done. 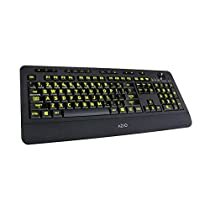 I ordered this keyboard Dec 13, 2013, (from this Amazon seller, as the price from same seller on eBay was more), and have been using it since Dec. 25. It is a standard PC104 layout. And this keyboard has the standard width "back", "enter",and "shift" keys. I'm a touch typist so keyboard feel is very important to accurate use. I'm still finding it's feel to be different then any of the many PC104 type keyboards that are used with PCs. The keys are not dished to the same human factor standard used on the original IBM design. The standard bumps on the F and J keys are not raised enough to give the intended tactile feedback. The key travel is OK but easy to add unwanted key press sequences. Ergonomics is still not there with this keyboard. The back lighting is great, and large letter keys are evenly lit up. Only the upper row number keys have the punctuation partly lit. I find red to be easiest on my eyes. Any of the other colors seem to flicker when seen in the peripheral vision, but not the fault of the keyboard. The major issue is that the shiny plastic bezel, is extremely static charged, and requires daily dusting to remove static attracted dust. I wanted to try the keyboard out before gifting it to my parents, as they complain of low level light issues using a non backlit keyboard. I find this feature great where I now do not need to turn the table lamp on for keyboard illumination. I changed the rating from 1 to 3, as the backlight is very handy. I'm getting used to this keyboard, and will keep it for myself and purchase another one for my parents. The static attraction of dust I have to live with, but using this in a dim lit room at night is so very handy, that I do not want to go back to the standard old keyboard. I do have to watch my use of other keyboards, as they have a different feel then this one. This Ivation has slightly less keystroke length, and lighter touch force. But it results in faster typing. I recommend this keyboard to anyone working in a dark workspace. It took a while but this keyboard has made me a better typist, as you must be more accurate in your finger work. The back lighting is still one of the best features of this keyboard. I never have to turn on the table light. My parents also like this keyboard for the ability to work in a dim or non lighted area. They have their computer in the bedroom, and can use the computer without any lighting. I've changed my rating from 3 to 4 stars. Now I just hope they keep selling this same keyboard, and do not substitute another design that take a dive into the realm of junk. A little over a year of use. The "A" and "S" keys are showing wear to the black surface coating, and letting more of the backlight out. That's not a big issue. I have had several key stick down and cause a repeat action. This is from dust/lint and other particulate munge that falls below. The fix that's worked so far is to put the keyboard on its edge, and press the stuck key. Then invert to see if the FOD will fall out. This backlighting has been so very handy, that if this keyboard were to fail, I would replace it.